With a sumptuous blend of sweet and savory, this dish, from the great Isreali chef, is classic Yotam Ottolenghi. It’s a little bit Middle Eastern, a little bit European, and a lot delicious. Red rice, like black rice, is densely nutritious and incredibly flavorful, with earthy, nutty notes a long ways from the blandness of white or even brown rice. Saute the white onion in 4 tablespoons of the olive oil until golden; add zucchini and saute until crisp-tender. Let cool completely. 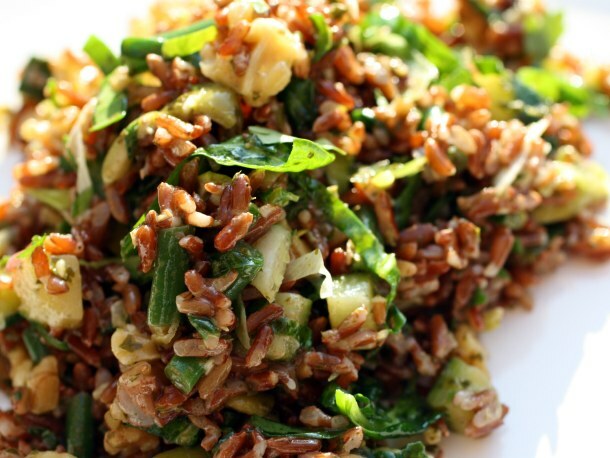 In a large mixing bowl combine the rice, quinoa, cooked onion and the remaining oil. Add all the rest of the ingredients, taste and adjust the seasoning. Serve at room temperature. TO COOK RED RICE: Heat 3 teaspoons olive oil in a medium size saute pan. When hot add 1 cup red rice. Fry, stirring, until rice is lightly browned and starting to pop like popcorn. Add 2 cups hot water and bring to a boil. Cover and cook, without stirring, for 20-25 minutes or until barely tender. Remove covered pan from heat and let rest for 15 minutes. Drain rice in a fine mesh strainer. Let cool. This entry was posted in Salads, Sides and tagged apricots, pistachios, quinoa, rice. Bookmark the permalink.